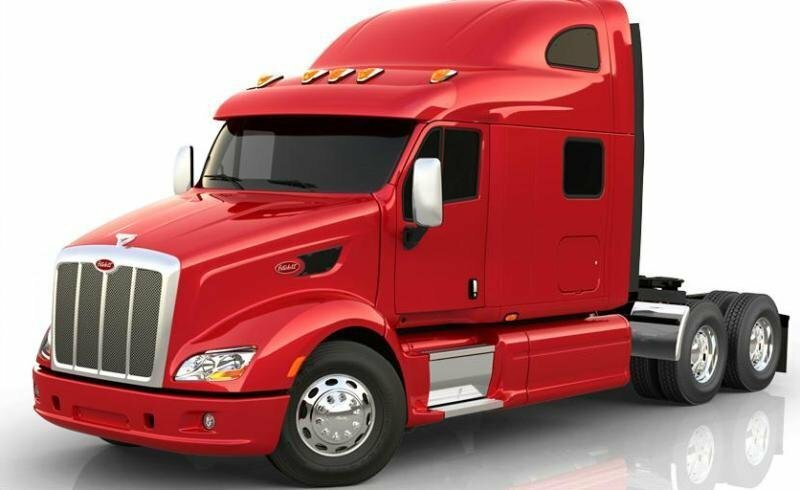 The Peterbilt 587 is an aerodynamic model which replaced the old 387 model and features a series of features which make it one of the most efficient trucks from the roads. Designed especially for highway applications the truck is available with both single or sleeper cab configurations and axle ratings of up to 46,000 lbs. In 2010 the Peterbilt 587 has earned the Environmental Protection Agency’s (EPA) SmartWay certification and had been recognized as fuel efficient and environmentally friendly. The truck is equipped with either the PACCAR MX engine rated at 380 – 485 horsepower or the Cummins ISX15 available with a horsepower range of 400 to 600. The engines can be mated on Fuller Manual or Automatic transmissions. You don’t need to analyze the exterior design too much to realize that it was engineered to offer a low drag coefficient. Every body panel received maximum attention and was designed to be as slippery as possible. Compared to the old 387 the 587 received a totally new front end design which smoothly cuts the air over and diverts is around the streamlined hood and bumper. The rake hood also improves the straight road visibility and is made of a lightweight material, helping to keep the truck’s weight to a minimum. The frond light clusters follow the same aerodynamic line as the rest of the truck and are equipped with a innovative forward lighting system which incorporates standard halogen lights that feature a 35% increase in brightness. There are also available optional high-intensity discharge lights provide a which provide 220% increase in brightness compared t the conventional lights. The company says that thanks to its aerodynamic shape the 587 model is able to offers 1.25% fuel efficiency compared to the 387 model. 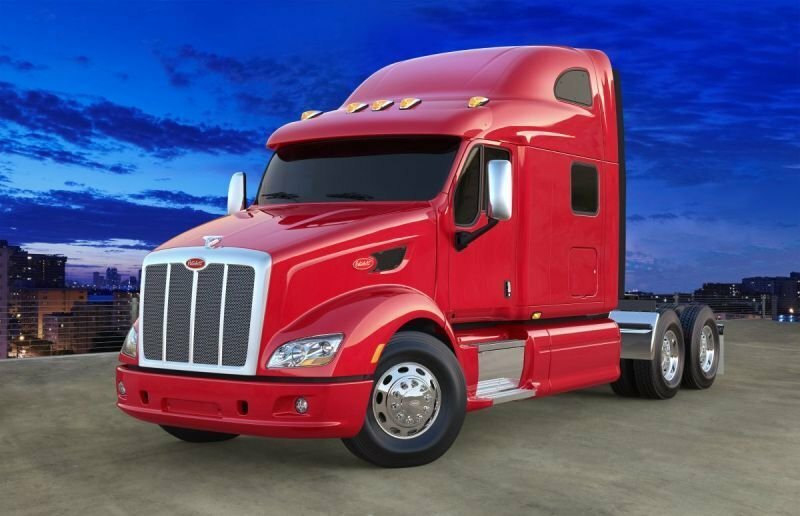 The long nose is dominated by the characteristic Peterbilt radiator grille which features three horizontal chromed stripes and a stainless steel grille. There is also a new robust gas spring design allows for easier opening and closing of the tool box for a safer storage of the items. The interior keeps the same dated feel as the old truck with a dull dash and an unattractive steering wheel. You’re also forced to move your body forward in order to reach the controls fitted on the dash which could get your attention of the road if you are driving. Apart from this problem the overall ergonomy is pretty good and the controls have a pretty intuitive layout. We also like the central instrument cluster layout which is one of the most uncluttered and well organized designs seen in this segment. The interior also features swivel seats with dual arm rests and a roomy 30-inch walk-through area providing plenty of space to move free around the cabin. The seats are at par with competition and offer a satisfactory support but without any significant side bolstering. They can also be adjusted according to your wishes, so finding an adequate driving position shouldn’t be a problem. Despite the relatively dated design of the steering wheel, it’s pretty ergonomically designed without being intrusive and also features tilt and telescoping adjustments. The superior trim level (Premium) is available with the SmartNav system, an in-dash, telematics and infotainment system. The SmartNav features a 7-inch touch screen that provides real-time vehicle monitoring, a navigation system, hands-free Bluetooth connectivity, voice recognition, a fully integrated audio system with satellite radio as well as MP3, USB and iPod capabilities. 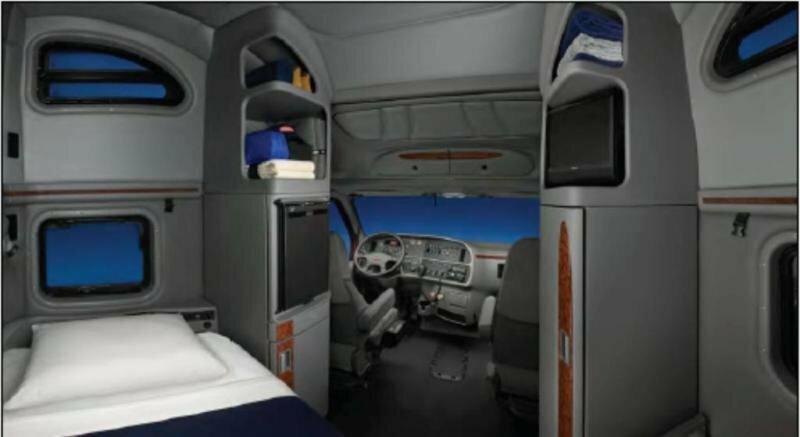 The sleeper cab is offered with a fairly comfortable bunk bed and additional storage places which include two convenient closets and under-bunk storage. Other storage places available can be found above the windshield while there are also two bottle holders under the central dash and a spacious glove box in front of the passenger’s seat. 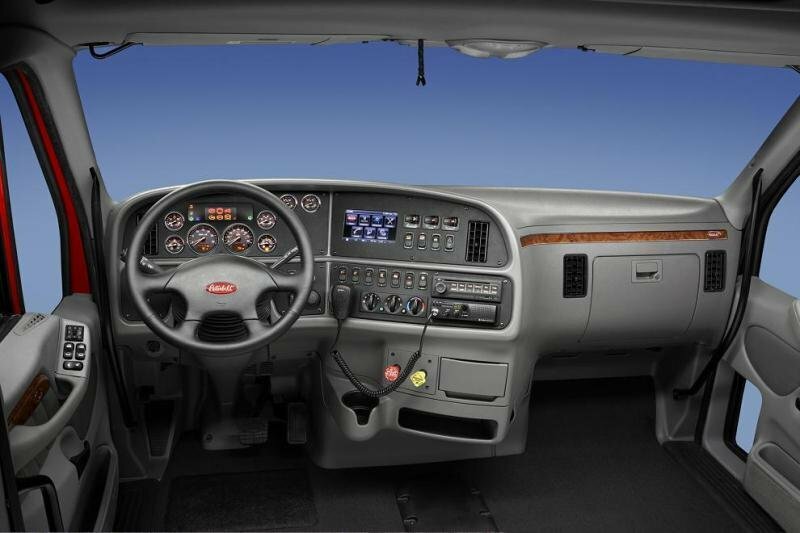 The Peterbilt 587 is powered by either PACCAR MX or Cummins ISX engines. The Paccar MX’s cylinder block has been designed without side covers whichi make it smoother and stiffer. The one-piece cylinder head has an integrated inlet manifold while the oil filter, oil thermostat and oil cooler have been combined in a single oil module. The engine also uses compact graphite iron for the block which makes it lighter and more resistant that the conventionally built engines which use grey iron. The Paccar MX is also available with an optional engine brake which offers enhanced stopping power and reduced brake lining wear. The Cummins ISX meets EPA’s 2010 emission regulations and develops between 400-600 hp with a maximum 2050 lb-ft of peak torque. 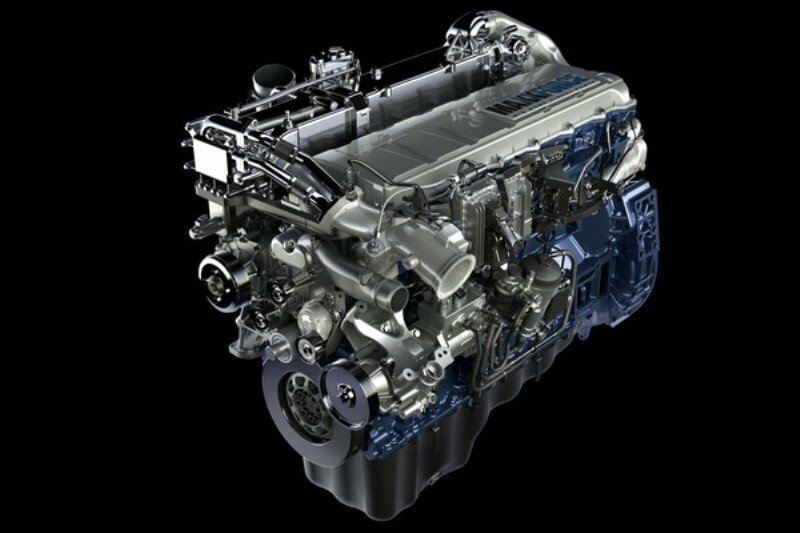 The ISX unit is fitted with a VGT turbocharger and also includes Selective Catalytic Reduction (SCR) technology for improved fuel efficiency and less impact on for the environment. The ISX 15 also offers the best-in-class engine brake with a braking horsepower of up to 600 bhp. Peterbilt’s front air leaf suspension is lightweight and features a 20% improvement in ride quality over taper leaf suspensions and is also compatible with air disc brakes and reduces tire wear. Moreover, the Front Air Leaf Suspension’s ride height was designed to match the popular Low Air Leaf and FLEX Air rear suspensions. The truck is available with single and tandem rear axles (Meritor or Dana Spicer) which can deal with up to 46.000 lb. of weight. Compared to the old 387 model the new 587 features a newly designed steering geometry that provides an curb-to-curb maneuverability improvement of 12%, which is combined with a light and responsive steering than makes the truck pretty easy to maneuver. The Peterbilt 587 drives right for its mission and is a good product perfectly suited for long haul operations. A fully equipped 587 feels almost luxurious and comes with plenty of goodies to keep you happy for at least a thousand miles. Peterbilt managed to a good job with its renewed 387, and the truck emerges in its new-generation as a fairly reliable road partner. The engines are also fairly strong and efficient while the overall build quality is solid enough to move huge payloads around the country without whining.